Rookie quarterback Nick Foles, filling in for injured starter Michael Vick, threw two touchdown passes in the first quarter to lead the Philadelphia Eagles to a 27-10 victory over the mistake-prone Cleveland Browns on Friday night. The Eagles hardly missed Vick, who bruised his ribs on Monday night against New England. Vick didn't accompany the team to Cleveland, but the oft-injured superstar is expected to be fully recovered and should be ready for the season opener. 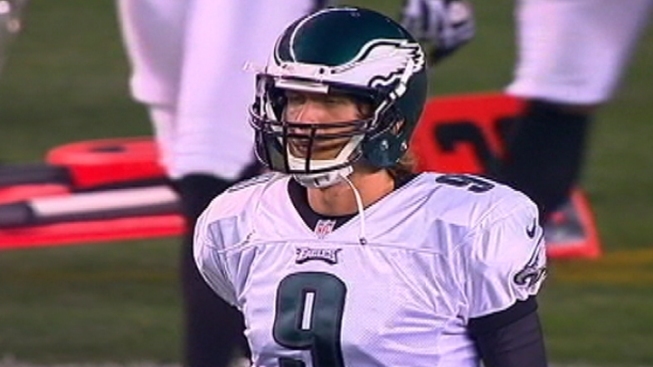 In case Vick's injury lingers, Foles looked like a reliable replacement. Taking advantage of a Cleveland miscue and the blocked punt, the third-round draft pick from Arizona rebounded from an interception by throwing two short TD passes in the opening quarter. Foles completed a 7-yard scoring pass to tight end Brent Celek, and then tossed a 2-yarder to running back Dion Lewis. Foles was intercepted on his second attempt, when he forced a deep throw into double coverage and was picked by Joe Haden. However, Foles also showed composure while facing a first-team defense for the first time, and he displayed nice touch on a 45-yard completion in the second quarter. Alex Henery's 41-yard field goal in the second quarter put the Eagles (No. 8 in the AP Pro32) ahead 17-0. Henery kicked a 28-yarder in the fourth. The 28-year-old Weeden was sharp early on, completing his first four passes for 66 yards and driving the Browns to Philadelphia's 2. But a holding penalty on guard Jason Pinkston backed the Browns up, and Weeden fumbled on the next play when he was sacked by Derek Landri, who came blasting in untouched through Cleveland's line. Later, Browns running back Montario Hardesty fumbled at Cleveland's 14, setting up the Eagles' first TD. With Haslam III and his wife, Dee, sitting in the renowned Dawg Pound section, where they signed autographs and posed for pictures, the Browns had a calamitous opening quarter. They fumbled three times, allowed three sacks, committed three penalties and punter Reggie Hodges had his kick stuffed. Colt McCoy, who lost his starting job to Weeden and is battling Seneca Wallace to be Cleveland's No. 2 QB, threw a 3-yard scoring pass to tight end Evan Moore early in the fourth. Weeden had some nice moments, but was constantly under pressure from Philadelphia's starting defense, a unit he'll see again in just over two weeks. He fumbled twice while trying to dodge danger. His longest completion was a 28-yarder to rookie Josh Gordon on the first play from scrimmage. Weeden has yet to throw a TD pass as a pro. The Browns (No. 30 in the AP Pro32) were again without rookie running back Trent Richardson, who has been sidelined since undergoing knee surgery on Aug. 9. The No. 3 overall pick is expected to return to practice this week, and the Browns are optimistic he'll be able to play in the opener.